The concluding part of The Passage trilogy is finally here. And it's worth the wait. This has been a monumental read, from the start of The Passage till the final moments of City of Mirrors, well these book haven't slowed down at all. 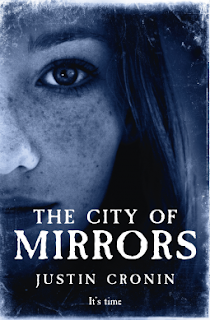 I was excited to get my paws on City of Mirrors but also it was very bittersweet as of course it means my journey with all of the characters was drawing to a close. Would this book manage to tie up all of the characters stories?, would there ever be peace in their world free from the dracs? Well as this is book three, I am not going to dignify that question with an answer because c'mon SPOILERS!!! But what does happen in this book is we go back in the past, before the outbreak and learn more about Zero aka Fanning, the scientist who was there when the virus reared its ugly head. We find out what sort of man he was, what motivated him and we get an good look at the things he did in his life, some of them not pretty. This bit of background knowledge fits in nicely with the what is happening in the characters now. Has it wrapped up the series nicely? Well yes but, there is always a but, there are still a lot of questions I'd like answered like what happened to the greater world, I mean this whole series could grow arms and legs. This is an epic series, each book is the size of a doorstop and if you are starting at book one, quite frankly you are going to lose a lot of days by just reading these books, my housework suffered badly throughout my read of City of Mirrors. If you like your books involving the fall of civilisation as we know it then I thoroughly recommend this series to you. Thank you to Orion Publishing for providing me with a copy in exchange for an honest review. This sounds like a powerful read. I've seen some reviews for The Passage and wanted to pick it up but didn't realize that this one was the conclusion of the trilogy. This definitely sounds like a read I shouldn't miss. It is a phenomenal series, so brilliant, I wish I could read it again from scratch!